Is Denzel Too Old To Play James Bond? Denzel has been half-joking about wanting to play James Bond. I don’t think he’s too old — people said he was too old to star in “Raisin in the Sun” earlier this year on Broadway and he proved them wrong. The problem with Denzel as Bond is that Bond is ineffably British and for the life of me I can’t imagine Denzel as a Brit. (The obvious choice for a black Bond is Idris Elba, though Daniel Craig, the current 007, isn’t going anywhere.) 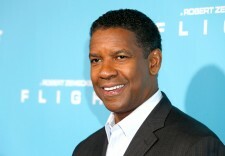 But Denzel remains a big fat star. According to the trades, his new movie, “The Equalizer,” is poised to be a monster hit. Idris’s New Movie: A Hit? Gaga To Sing Bond Theme Song? Idris Joins “Cats”: So Much For Playing Bond! New Bond Film: Gay Necrophilia?